These easy-to-read, progressive exercises by Joanne Martin develop a student's reading skills one stage at a time, with many repetitions at each stage. 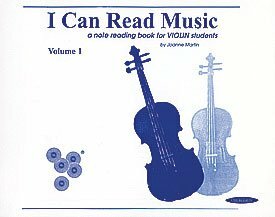 I Can Read Music is designed as a first note-reading book for students of string instruments who have learned to play using an aural approach such as the Suzuki Method®, or for traditionally taught students who need extra note reading practice. Its presentation of new ideas is clear enough that it can be used daily at home by quite young children and their parents, with the teacher checking progress every week or two.